Learning a foreign language abroad opens a world of wonderful possibilities: language and cultural immersion, new friends from different countries, interesting ideas, new impressions and plenty of positive emotions! This summer FLC Reward provided its students who learn Italian with the opportunity to make an unforgettable journey to the Leonardo da Vinci School in Rome. Rome is in the heart of Italy. It is a centuries-old city with a great history and culture and an outdoors City Museum. Everyone who comes for the first time admires Rome’s beauty and greatness. We couldn’t resist this magnificent city. Everything was amazing, including: the grandeur of ancient monuments and colossal ruins which have survived to this day; the beauty of marble fountains; and the mightiness of palaces and churches from a different era. We had the opportunity to visit ancient monuments such as the Roman Forum, the Coliseum, the Pantheon, and amazing Vatican Museums. 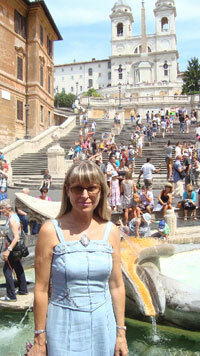 We also enjoyed the glory of the Trevi Fountain, Piazza Navona and Piazza Venezia. After sightseeing we could enjoy a cup of coffee in the one of numerous caf?s and then do more shopping as August is discount time. 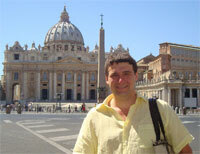 FLC Reward’s students lived in the centre of Rome in the most beautiful district near the Vatican. 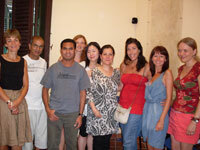 Leonardo da Vinci School is also situated in the centre of the city within walking distance of famous landmarks. 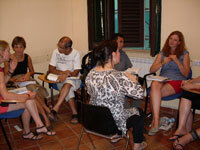 In the first day students were tested and distributed in groups. Professional Italian teachers at once won the attention of all our students not only because of using modern communication methods of training, but a true Italian artistry and temperament. Classes were fascinating. The immersion to language environment and effective training technologies which help to remove the language barrier and stimulate the natural communication in Italian contributed to the effective assimilation of this beautiful language. 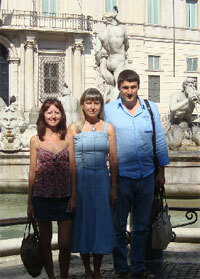 In addition, the accompanying teacher of Italian from Russia could always answer any questions and help to understand the homework. All the students worked in international groups and had an opportunity to find friends from France, Germany, Switzerland, Britain, Finland, the USA, Australia, Japan, Brazil and other countries. It was interesting to discover that a popular American writer Elisabeth Gilbert studied in the Rome Leonardo da Vinci School a few years ago and then described her experience of being in Italy in the bestseller ‘Eat, Pray, Love’. This book was filmed starring Julia Roberts. Of course, we’ve bought this film and add it to the FLC Reward’s Italian film collection. The Leonardo da Vinci School’s teachers are sure that learning a language is directly related to the comprehension of the country and its culture. So after classes the school organized excursions to Roman attractions in Italian language, and informal meetings in Roman bars and trattorias, where students had the additional opportunity to speak in Italian. At the end of the course all the students got school certificates. We’re looking forward to next year’s return to the Eternal City. 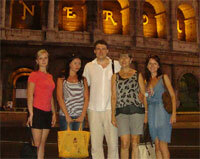 Learning Italian in Italy is an invaluable experience and unforgettable trip which will always be remembered.